It is with sadness and a heavy heart that I pass along the news that little Gwen passed away this morning. Gwen came to us several months ago from San Francisco Animal Care and Control. 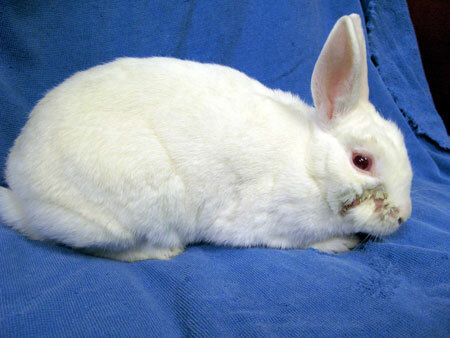 At that time she appeared to be a healthy, cute, little white bunny who just had been at the shelter too long. Not long after she was rescued, she started drooling at her foster home and she came back to SaveABunny for care. She received excellent care with Dr. Scheenstra and Dr. Harvey. She had several dental surgeries. We tried all kinds of combinations of pain medications and antibiotics. Nothing seemed to work. She would get a little better than much worse. X-rays and other exams couldn't find an explanation for her problems. The good news through all of this is that I had bonded Gwen into a group of our "misfit" bunnies---Ralph, Annie, Thor and now Gwen. All had major health and or behavioral problems, but they ADORED each other. In fact, about two weeks ago I was worried about Gwen. I asked Cathy Malkin, the animal communicator with whom we work if Gwen was suffering and wanted us to euthanize her. Cathy said that while Gwen was uncomfortable, she was not suffering and was extremely happy and secure with her bunny friends. So, we decided to let Gwen do what she wanted. All her bunny fried had messy fur from dried Gwen drool all over their backs from snuggling with her. It was common to see all of them piled together napping . They were all protective of Gwen. It was really touching. Gwen just couldn't fight whatever is was anymore and slipped away today. Gwen has taken a major turn for the worse and her prognosis is very guarded. Dr. Carolynn Harvey peformed surgery on Gwen's jaw to remove infection. Despite a good surgical outcome, ongoing antibiotics and pain management Gwen is not doing well and we are very concerned about her. Please send good thoughts her way and for those of us at SaveABunny who love her very much and only want her to be happy, healthy and enjoy a good quality of life. We will update you as soon as we know more. The bright spot in Gwen's life is that she is now living in a group/warren with three other special needs rabbits and they all groom and snuggle each other--Ralph, Annie and Thor. Yes, even Thor! Gwen is an adorable, small dwarf mix girl who is sweet, friendly and very lonely. She had been waiting for a long time at the shelter for someone to love her and take her home. The shelter became overcrowded and Gwen had been there the longest, so SaveABunny took her into rescue. She is very eager to be loved and now just waiting for the right person to fall in love with her. She spent some quality time in a foster home, but they were unable to keep her long-term, so she is back at SaveABunny. If you are looking for a beautiful, petite bunny girl you will want to meet Gwen. She's precious. Recently Gwen has had a health setback with dental issues and an infection. She is undergoing treatment and needs a medical foster home to help her heal. She's really a sweet girl who just wants to be loved. Can you help by fostering or donating to help with her care?